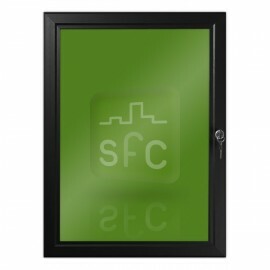 Black indoor or outdoor poster display frame with key lock for A4 posters (297mm x 210mm). Stylish, slim black display frames, ideal for displaying posters and notices indoors or outdoors where additional security is required. The hinged frame is glazed with a high impact resistant front panel and secured with a key lock. You can mount the frame portrait or landscape to suit. Brushed aluminium and magnetic varieties also available. COMES COMPLETE WITH SCREWS FOR MOUNTING.